It’s Sunday- the perfect day to take a stroll scroll through the Twilight Art Gallery. 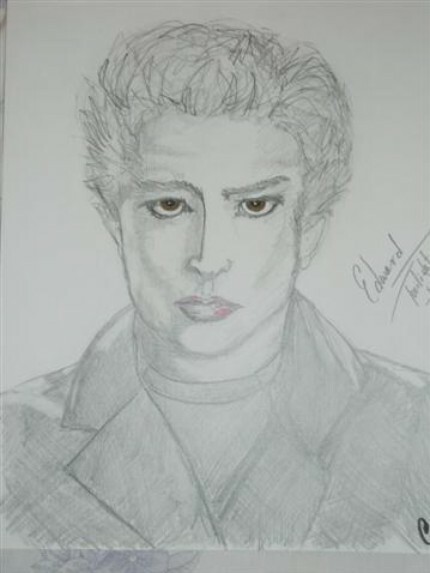 Our next artist has done a beautiful job depicting what Edward might look like as a drag queen. Perfecting your outfit for Rob Pattinson stalking does not come cheap. These custom shoes are $130. This concludes our Sunday tour of the Twilight Art Gallery. I hope you are inspired! Thanks for Sara & Li Li for the links! *Etsy links not shown to protect the artist we are making fun of honoring. If you would like to puchase one of these pieces, please e-mail us & we’ll be happy to send you to their Etsy stores. And then we will make fun of you. Behind your back. And probably publically. okay, erhm, i think the first one is a nice idea but brought to paper badly. the second is a lame-o copy of a twiposter. and the shoes… horrid, even though you have to admire how much effort they must have been taking. I’m glad my artist talents only include knitting “sparklepeen’s” and lurking behind Dumpster’s “ifyouknowwhatI’msaying”………. Ruby, is there a photo of knitted sparklepeen? I would really, and I mean REALLY like to see it! Really. Hop on to the forum- the archives- tuesday stewsday 06/08- page 4 and lo and behold knitted sparklepeen…. Oh Ruby, I heart you so much right now. WISH that I had that amount of talent. My craftiness is totally unrelated to Twi-anything or sparklepeens, oh well. I especially like the jaunty scarf!! UC, Moon and Rob riding on a Unicorn…perhaps incorporating black velvet? Eating cookies? Holding an apple? Wearing Pattz Pants? ‘Art’ sweater? A random floating Dad/Mom case? Is this do-able? Is it weird that I want this as my screensaver? Pro-3, you are brilliant as usual. I am a crafty gal, and could probably pull this piece off in some kind of multi-media collage, my drawing skills are nil. Maybe we could collaborate. Do you have any helpful tips for hiding said art piece from Mr LPB? All that to say…I believe that either Mr. Pro is ‘incredibly unobservant’ (there I go again…this time it works) OR I am a Twi-concealing Ninja! If I can harness this dark gift into some sort of collective ability, I will share happily with you and anyone else who cares to partake. Dare we craft, twi art so deliciously atrocious that it will raise the echelon of twi crap everywhere to levels so unattainable that fangirls will implode with glee? Yes, yes we should. Or….we could just laugh about the potential of this concept? Ya….I just had a coffee. If I had mad photoshop skillz, I would make you that screensaver….maybe I can get a tutorial from my son, he’s the whiz kid…. Twi-Concealing Ninja should be your pen name when you start writing your own FanFics! I know for sure that Mr LPB has no clue about me reading FF, I am SO glad to have my own computer so I don’t have to cover my tracks! Despite the fact that these people are clearly sorta talented, and can draw a bazillion times better than I ever could, these pictures are still rather embarrassing to look at. Pleas tell me these are not actual Chuck All-Stars that have been tainted. Please tell me they are a $10 KMart knock off. Yikes. It will make you laugh and cringe. I promise. All right, done pimpin’. no way! not wrong to pimp your thread. if you email me & remind me i’ll pimp it out in a post this week! I know creativity is different for everyone and hence interpretation of your thoughts is always unique. Even when we read the same book, the version of our imagination of any description in the book will be dissimilar. And I think as long as you have inspiration like Twilight saga and Rob is there, gems like these would always be around and would surface and resurface almost all the time. In addition we are very open minded so we will notice them no matter how it makes us feel. Best wishes for future inspiration and interpretation. I sort of love those shoes, weird creepy faces and random quotes, love it, but they are way out of my price range. …. woops hit submit too soon.. from Napoleon Dynamite. Ummm… do you think if I make an entire outfit dedicated to Twilight, that I will make lots of money on it? I mean. 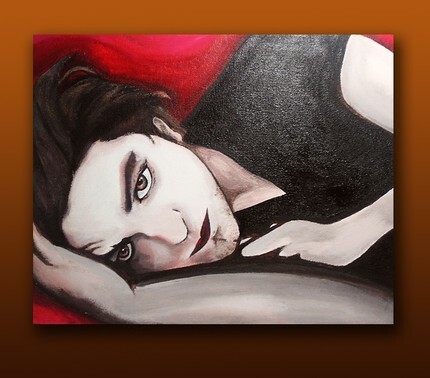 We already have Pattinson Pants… why not A Stewart Shirt, or Rathborne hat? What about a Lutz purse? Damn. I was hoping to make millions!! Or at least going to Twicon and having Jackson fall in love with me because of my amazing fashion statement? I would SO fit in at a 100 Monkey’s concert, no?? 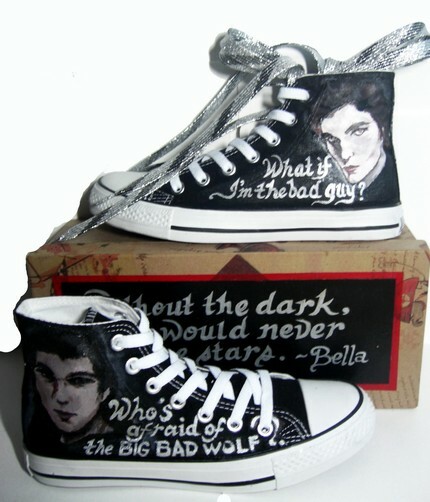 What *is* it about Twi-Hards and their love of the ridiculous shoe-as-art?! Score, you posted my creepy photo that I found. Love it. Let’s get Twilight shoes/flip flops and wear them to The Tuck. UC – xoxo!! it makes me scream every time! I think bear bella looks more manly than the crooked face drag edward. just saying. and the shoes….want to know the worst part? ive seen those before. IN REAL LIFE. ON SOMEONES FEET. IN DAYLIGHT. I almost cried. because I was loling so hard. 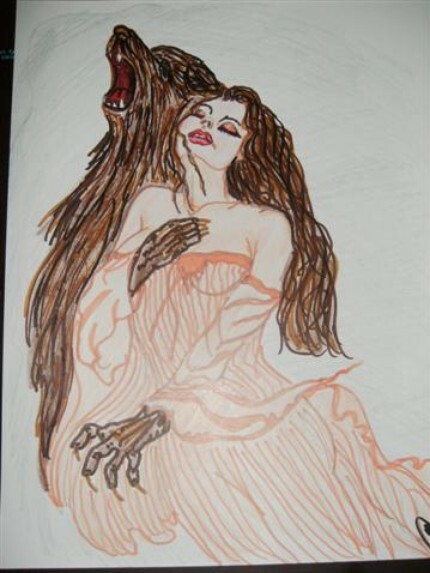 oh and the good twilight art is freaking beautiful times ten. I wish I had prints of them in my home. Now that I think about it… that sounds like Kristen, maybe she was dreaming of Jacob being in her room.